Like many adults, Heath lives in a different region from his family. While he continues to create lasting friendships with his roommates, staff, and peers; Heath was ready to catch up with his relatives again. Heath’s parents passed away in 2002. 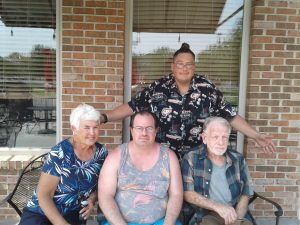 Since then, Heath has wanted to have a birthday celebration with his aunt and uncle in Clinton, Missouri. Travel is something many of us take for granted. It’s an activity that requires time, money, and a form of transportation. Unfortunately, challenges can arise when gathering these resources. Heath depends on staff or public transportation when he wants to travel. ACT believes it’s important to help individuals realize their dreams and goals. When Heath’s family invited him to his cousin’s birthday celebration, staff were determined to make it happen. And it did. Heath thoroughly appreciated his visit. “What I enjoyed most was being around family and talking about the good times,” said Heath. We are happy Heath was able to make new memories and future plans for another get-together during the upcoming holidays.